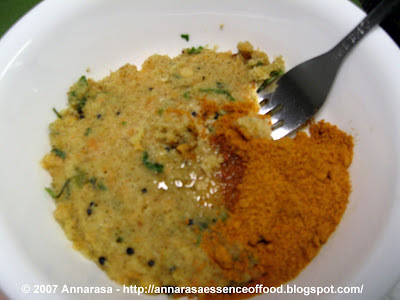 Upma is a great breakfast food - quick to make, filling, and very nutritious too. When I was a child, we had it every weekend for brunch amongst other goodies. But often as a treat it found its way into our school lunch boxes!! Over time I have worked to simplify the recipe so that its microwave ready for a whenever snack!! Heat the ghee in a large non-stick pan. Add the mustard seeds, and when they begin to pop, lower the heat. Next add the chana and urad dals. when they turn golden brown, add the cashews and red chillies. Fry until the chillies are crisp and the cashews golden brown. Now, add the cilantro and grated ginger and continue to fry for 30 seconds. Finally tip the sooji into the frying pan and roast with all the other ingredients on low heat until it gives off a fragrance. Remove into a heat resistant plate and let cool completely. The upma mix is ready. Store in an airtight box in the refrigerator to shelf for 7-10 day until needed. Alternatively it will stay in the freeze indefinitely. To make Quick Microwave Upma, remove desired amount into a microwave safe bowl (avoid using plastic), pour hot water and add salt to taste. Generally 2 parts water to 1 part upma mix should be enough. Place in the microwave, and cook for 2 minutes per serving in the pan. Enjoy with your favourite chutney or plain yogurt. This was a great tip - freezing the upma mix. Can we prepare the upma(using the water) and then freeze it ? Thanks for that reply Apu. I was making this recipe according to your post and just had this thought. Great blog as for me. It would be great to read a bit more concerning this theme. Thnx for sharing this data. Great tip about freezing the upma mix. Will definitely try it out. On a side note have you ever tried freezing cooked upma itself?